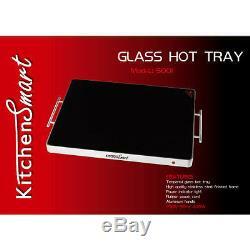 Large size: 540mm x 410mm x 65mm Tempered glass hot tray. High quality stainless steel finished frame with aluminium handles. Power indicator light - Rubber heat-proof power cord - switch plug with power indicator light. Thermostat keeps heat at temperature range between 80°C to 130°C. The item "Large Glass Top Hot Tray Electric Hotplate Hot Tray Catering Warming Tray" is in sale since Wednesday, November 29, 2017. This item is in the category "Home, Furniture & DIY\Appliances\Small Kitchen Appliances\Food Warmers". The seller is "ksdltd17" and is located in Salford. This item can be shipped to United Kingdom, Austria, Belgium, Bulgaria, Croatia, Cyprus, Czech republic, Denmark, Estonia, Finland, France, Germany, Greece, Hungary, Ireland, Italy, Latvia, Lithuania, Luxembourg, Malta, Netherlands, Poland, Portugal, Romania, Slovakia, Slovenia, Spain, Sweden, Australia, United States, Canada, Brazil, Japan, New Zealand, China, Israel, Hong Kong, Norway, Indonesia, Malaysia, Mexico, Singapore, South Korea, Switzerland, Taiwan, Thailand, Saudi arabia, South africa, United arab emirates, Ukraine, Chile.